The risks of prolonged sitting and unhealthy work behavior are prominent and have been studied well. According to a study done by MayoClinic, prolonged sitting is linked with a number of health concerns. They include obesity and a cluster of conditions — increased blood pressure, high blood sugar, excess body fat around the waist and abnormal cholesterol levels — that make up metabolic syndrome. Too much sitting overall and prolonged periods of sitting also seem to increase the risk of death from cardiovascular disease and cancer. Just like many other bad habits (like smoking, eating sweets, and drinking alcohol), the awareness of the (long-term) risks of sitting doesn’t really make us change our behavior. There are many reasons that can explain why we are so ignorant. One of the reasons has to do with the associations we make in our brain. Let’s go to our brain. The brain is great in making associations between places, activities, and emotions (source). We associate activities with places, places with emotions, and emotions with activities. Your brain connects places, thoughts, and emotions together by making new synapses that connect/link the neurons with each other. If you visit the forest in your neighborhood where you grew up, you instantly associate it with certain emotions and activities, locked up in your memory (like building huts and having fun). The more we perform certain activities, the stronger (thicker) the links become in our mind. If you get hurt in a room every time you enter it, you won’t like to enter it, even though the room is not necessarily linked to pain itself, it is just a room. But the room has become a “pain room” in your mind. All day long we associate the objects and places we see with certain activities. For example, when you look at your couch at home, you associate it with relaxation, watching TV, or/and eating snacks. Your bed is associated with sleeping and resting (that is why they say you shouldn’t work on your phone in bed). While your workplace is associated with being productive, focus, and working. The associations of the things we do/see the most, are very strong. We are very connected to the places we know best. Namely, our whole identity/behavior flips when being in different places. A businessman who works at an office-building could be a formal, confident man with a deep voice always on the phone. But once he enters his home and see’s his wife and kids, he could become a very different person. It’s almost like you are a different person when being in different places with different people, you experience different emotions, and you do different activities. Just imagine the awkward situations when you have your child, partner, and colleague’s together in one room. How do you behave? Who is the true you? Let’s not get philosophical here. Thus, you associate your work environment with productivity, focus, status, seriousness, and formality (at most offices). The work environment is often not associated with health behavior. Like a football-field is made for football, a workplace is made for work. Therefore, you just wouldn’t start to exercise on work. For now, I will focus on physical activity to increase your health, but the same concept accounts also for other area’s of health; people also have a difficult time napping at work, and with extensively cooking a healthy meal. When it comes to the relationship between the workplace and health behavior, there are two sides; one of them is the workplace and the other side is the mind. These two go together. Because we don’t exercise at work, the workplace becomes less fitting for it, and because a workplace is not fit for exercise, we don’t exercise it in it. We don’t have equipment to exercise at our work. We don’t wear clothes at work that are fit for exercising. Because of this positive feedback loop, work and physical activity are quite far apart in our mind. So now, usually many people can only engage in any form of physical activity when they are at the exercise track, in their exercise clothes, with their exercise-friends. People are quite hypocrite in splitting the one activity from the other. They often use “categories” to distinct activities from places, and emotions. For example, many people hate to carry heavy groceries in the supermarket but they do want to carry heavy weights in the gym. Even though these activities are both essentially the same thing, with the same effect. For people, supermarket = lazy, and gym = exercise. Moreover, I developed this easy method that makes you stronger without working out, but this hasn’t gained popularity yet, maybe because of the same reason. 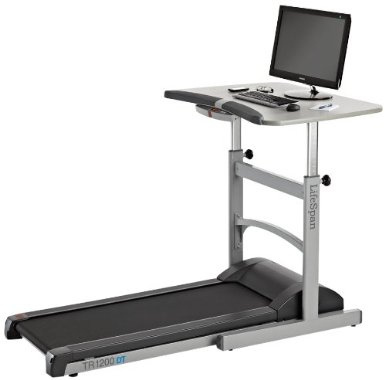 The tread mill desk. Too physically engaging? What is necessary to make people work healthy? So physical activity is not associated with the work environment. But as mentioned, we know that prolonged sitting causes several health-problems. Thus it is necessary to associate work with physical activity for the sake of the health of office workers. This means that physical activity needs to be associated with work, or work needs to be associated physical activity. Thus the association process can work both ways and below I will describe several methods that work in each way. As we know by now, there is a large gap between work and physical activity. However, today there are many gadgets and furniture that are searching for the “thin lines” that make the workplace closer to environment where physical activity is allowed. Here, it is obligatory that these objects are useful during work, while having a (small) positive effect on our health (otherwise it is too much associated with a sports field). The effects seem to be a trade-off, where to much physically engaging activity reduces the usefulness for work, and too little doesn’t have any effect. For example, you have a office-desk that is integrated with a treadmill, which is often to physically engaging for workers; you can’t think/type well while running. Sit-standing desks are more fitting and just require you to stand while working. Not too much physically engaging, and not too much distracting from work-activities. Some studies even suggest that standing is beneficial for working creativity! You can have many healthy furniture in your office, but if the minds of the workers do not connect work with physical activity, they won’t use them. I heard people say; “I came to work, not to exercise”. But you can overcome this. One thing often used, is a trick from marketing called “Nudging“. Nudging is a “gentle (implicit) push towards the right direction“. So a nudge is a subtle reminder, poster, or placement of objects that makes you change your behavior almost unconsciously. Like having a poster of exercising people inside the office or posters of a library inside a silence-working room. 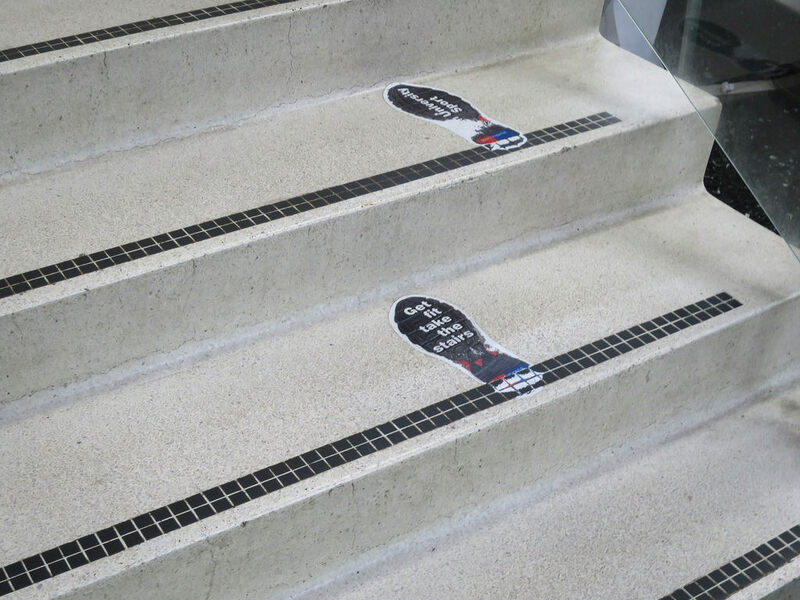 But you can also have posters showing the risks of endured sitting. It does nothing directly, but it makes you connect work with physical activity subtly. Nudges are very subtle. Less subtle ways like information sessions, workshops or interventions, can have similar or better effects. Changing the minds of workers can lead (slowly) towards self-initiated behavior change. Workshops should enforce the feeling that it is okay to be physically active on work or should try to break the “office culture” that work and physical activity are that far apart. As mentioned earlier, people are used to keep physical activity for their exercise court. People think of activities of categories; health is only “active” during exercising. But there are studies suggesting that only exercising in the evening does not compensate for the 8 hours of sitting during the day. If you approach health as an continuous concept, and convince workers that “health” does not only means exercising on the track. Health is a concept that is present 24 hours a day, at work, at home, during your sleep, thus a category that lasts 24 hours a day. By spreading this message, health will be associated with all the places within the mind. Healthy living becomes an integral part of life and has no boundaries between activities. We also shouldn’t forget that health is a concept in the mind and health can have many meanings across different minds. Read also my blog about the benefits and paradoxes of (measuring) health integrally. For some people, health is just about not being ill. While for others, health is living engaged, pro-actively, and happy. This is a huge difference. When doing health-education this is something to give attention to, and might be quite important for the adoption of health interventions. Personally, I rather approach health using the latter definition. Approaching health as something you can always increase instead of something that you should avoid to get worse, gives it a positive direction with a clear direction. There are several trends using this approach like Positive Health and Positive psychology in general. Although you can always wonder whether there is a limit to how healthy you could be. Nevertheless, approaching health positively, makes it more easier to introduce the “fun factor” in interventions, you can think about gamification or positive rewards. Furthermore, I believe that these incentive’s would be easier accepted if you approach health positively, but it is important to be genuine when you introduce your program (I plan to write a blog on this). Nevertheless, one can perceive himself to be quite healthy, but the state of a body might imply something different. However, if there is no awareness of the physical state of the body, perception does not change. Awareness of health (behavior) through understanding the physical state of the body can have many effects on behavior. An “office health check” can confront people with their physical state, while an activity tracker can confront people with their current health behavior. Awareness about the physical state, and health behavior can give health a more prominent place in life and engage their mind into healthier living. The workplace can be more connected to physical activity. While on the other side, the mind of office workers can be more connected to physical activity. Connecting physical activity in the minds of workers to the work environment will make them more likely to use the furniture that connects the work environment to physical activity. Lastly, changing personal definitions of health, and tools like health checks and wearable’s can change minds in general towards a “better” understanding of health. This new mindset might be sufficient to change peoples’ intrinsic behavior towards healthier living. There are of course several costs related to make workers work and life healthier. But if you account for the potential benefits of healthy workers; less sickdays, more productivity, focus, work engagement, company engagement, you might consider it as a manager. And we shouldn’t fool ourselves and recognize that managers, HR, and facility, are huge stakeholders in supporting the health of their employees. They have the power to support the workers in their needs for behavior change. But on the other side, there is also a responsibility for the individual employees, they are responsible for their health. But I believe responsibility goes both ways; read more about this in this blog.